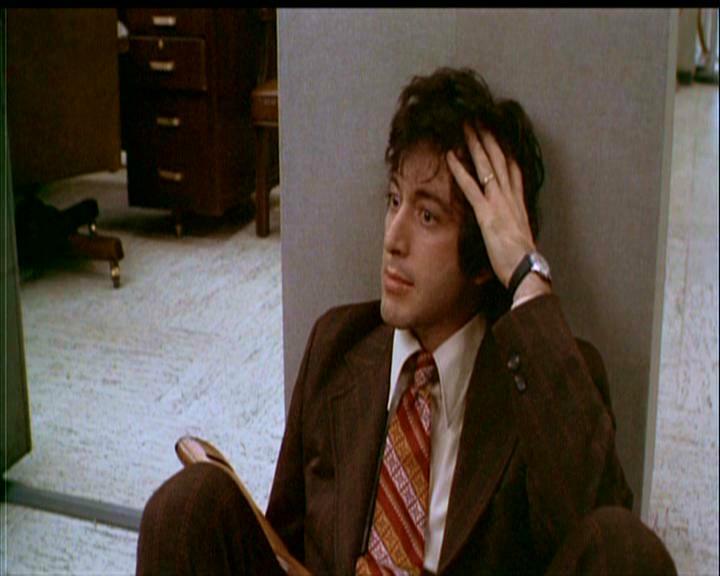 The work of Sidney Lumet has become more and more of an obssession for me of late. 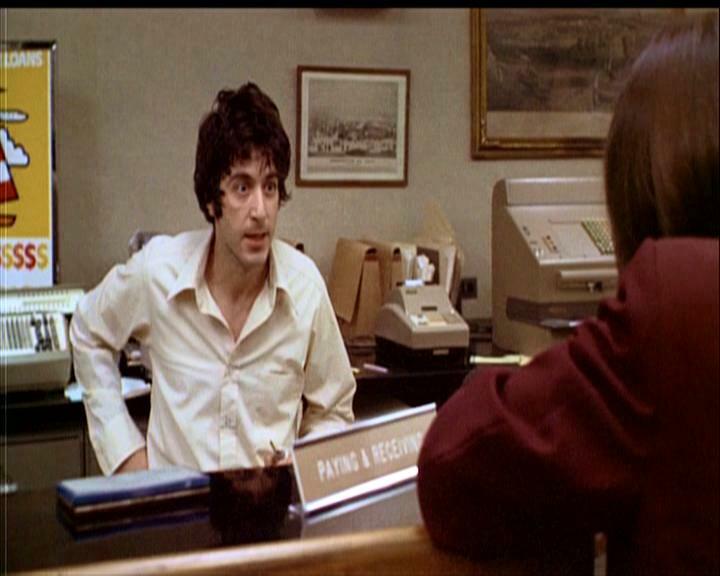 The latest offering I’ve had the pleasure of looking at is DOG DAY AFTERNOON (1975). This picture, like 12 ANGRY MEN and NETWORK is on the whole, set in one location, but follows a very complex set of circumstances and characters. 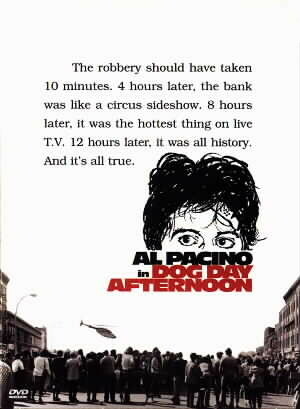 The story of DOG DAY AFTERNOON is a true one, as the film poster and the title at the begining of the film inform us. The year is 1972, August 22nd to be precise, the place is Brooklyn, New York. 3 guys walk into a bank with a view to holding the place up and getting out within a few minutes, it didn’t quite work out like that. The incident became a hostage situation covered by national news channels and watched by crowds of baying onlookers. 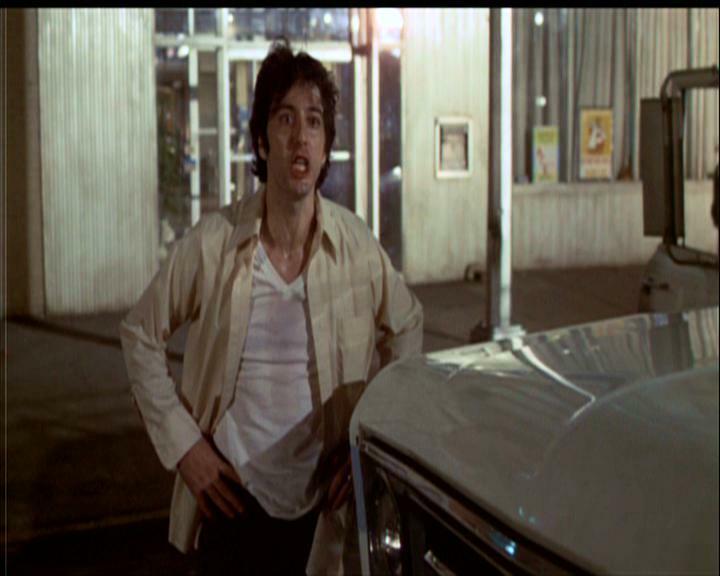 Lumet captures the happening in a raw documentary style, the title sequence is real footage of 70’s New York life. Dirty sidewalks, bums lying sleeping and boats reversing into the Hudson gives the start of the picture a genuine feel that carries on throughout. You can have a look at it below, the music playing is an Elton John track, the first and last time music is heard in the film. no soundtrack, no incidental music. This absence is another powerful tool to heighten the realism of the piece, a realism both praised and criticised by John Wojtowicz, the real life robber, see a piece he wrote regarding the picture here. 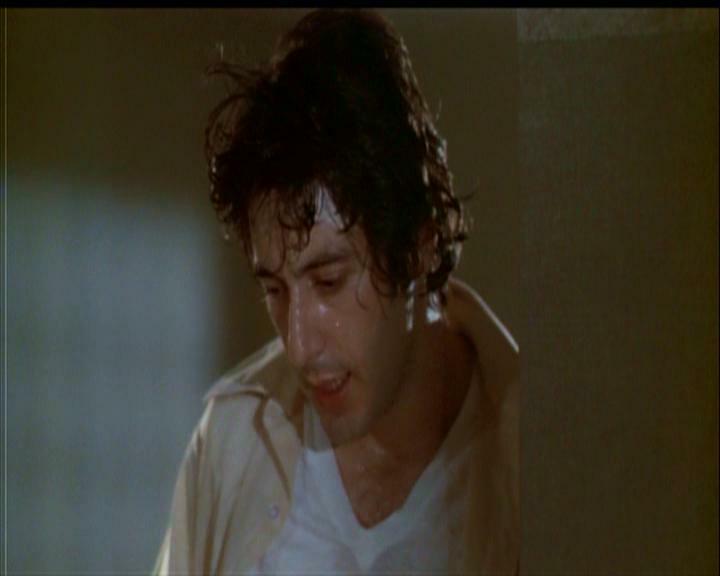 Al Pacino plays Sonny Wortzik (Wojtowicz) with John Cazale playing the sidekick who doesn’t chicken out (One guy did a few minutes into the raid) and flee, Sal (Sal Naturale in real life). This is an interesting piece of casting as Naturale was only 18 at the time of the incident whereas Cazale was 40 when the picture was made. 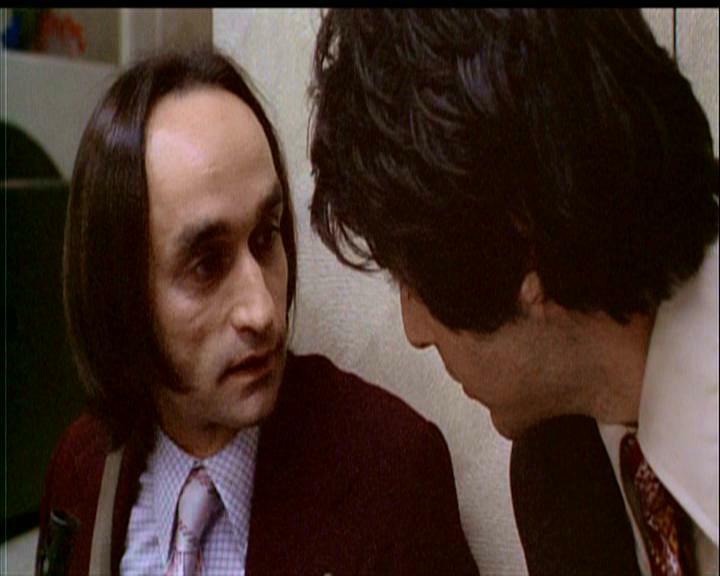 Cazale is fantastic here however as the underplayed, understated sidekick. Pacino does all the talking but you always get the feeling that Sal is the one most likely to do real human damage if the situation demands it. This is only Cazale’s 4th feature and he was only to make one more due to having bone cancer, a disease he worked through on his final feature. No one could have hoped to have achieved more in a 5 picture career. He had notable parts in THE GODFATHER, THE CONVERSATION, THE GODFATHER pt. 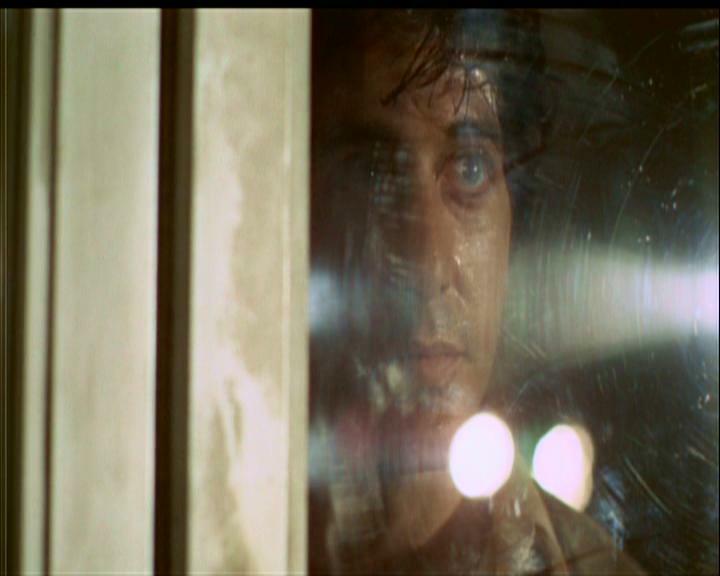 2, DOG DAY AFTERNOON and THE DEER HUNTER. Sal’s journey in this movie is, of course, not the primary concern. The motivations of Sonny are infinately more interesting, as any preconceptions you have are blown out the water in the final 3rd of the movie forcing you to re-examine Sonny as a person. Lumet photographs and stages the various sections of this development wonderfully as the stills below show. In Sidney Lumet’s book “MAKING MOVIES he says that DDA was one of the most difficult pictures he’d taken on due to a multitude of location problems and hundreds of extras to coordinate. 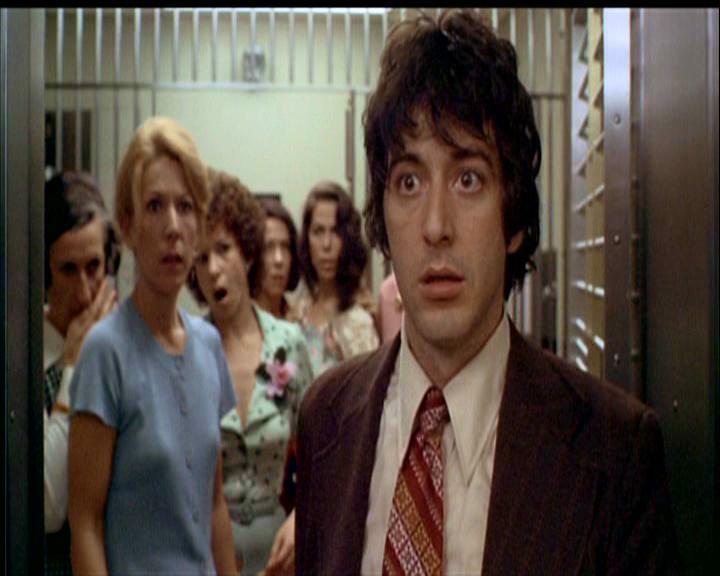 The scene below gives a taster of both the feel of the movie and lends weight to what Lumet is talking about. There is a kinetic quality to the picture despite no one going anywhere. Seeing this movie as an introduction to Lumet will leave you wanting more, I guarantee it. What’s the best way to spend a bank holiday Monday? The answer of course is to lock yourself away and watch a triple bill that covers a film from each of the following years…..
And the year of your first birthday. The above clip is obviously the title sequence and I love it to bits. Not only do the gharish colours work, they REEK of cool. This is the first taste of blaxploitation cinema I’ve had, outside of SHAFT (1971) and SUPERFLY (1972). Pam Grier is Foxy Brown with Antonio Fargas playing her brother Link. Link is to blame for every scrape foxy gets into in this picture, I’ll not say too much as the film should be watched, get it on your lovefilm lists. the scene below is the famous lesbian bar fight scene. A working girl Foxy is trapped with finds herself in a bit of a jam, in steps Foxy, job done. What’s great is the 70’s stereotyping of the lesbian look, real tasty. This Claude Chabrol film from the year of my birth takes a lot of stick. There are also no clips of it on youtube. The picture follows the marriage of Phillipe and Esther. The couple appear to have a happy relationship at the start of the picture but his narcissistic, domineering personality eventually drives them apart. This is not a film for the faint hearted. Phillipe is a devoted father and you want to give him credit for it but he is also an absolute beast towards his gentle wife who, although being kinda nice, does herself no favours by being so docile it is hard to sympathise with her too much. Permitted infedelity is soon brought into play with Phillipe seeming blase about the fact his wife is sleeping with another man whilst at the same time trying to control and belittle her. It is a very complex look at married life alongside the amplified failings of man. Not for everyone, probably not a picture for repeat viewings but it merits a go. Following my blog on 12 ANGRY MEN a few days ago I finished my 70’s triple with Sidney Lumet’s NETWORK. I’m really gettin into Lumet’s work, it has a real honesty that doesn’t need to dress itself up as anything other than a look at the truth. NETWORK is as relevant today as it was in 1976. The feeling of anger, the suspicion surrounding what we’re fed by the cathode ray tv tube and the decisions driving what we see on it have not changed. Not one bit. the 2 clips below show Howard Beal preaching to the nation. To him it’s truth, it’s an attempt to show the American public the light, or at least a glimmer of it. To the network chiefs he’s a circus sideshow….. Enjoy. I’m assuming a lot of people have seen this film but I felt compelled to say something about it. It’s one of those pictures that had been in my collection for months but getting round to it had always been blocked by something. About 5 weeks ago I put it on and, before the credits even started to roll, I got a huge pang of guilt because I hadn’t seen Kurosawa’s RASHOMON (1950) so that went on…. More on that later. A few weeks later I stuck it in a bag, amongst some others to take through to Jamie Stone’s with the intention of watching it on his projector, to give it some big screen respect. Much to my delight we ended up watching THE GREAT ESCAPE (1963) which was very fitting for the shoot we were doing but, again, prevented me from watching it. Last night I was about to start watching 3 COLOURS: BLUE (1993) (which again, is a picture I’m ashamed not to have seen) when this movie demanded to be seen….. the film I speak of is, of course, Sidney Lumet’s 12 ANGRY MEN (1957). Never before did I think a picture set in one room be so absolutely riveting. All facets of American life and society are around the table as part of a jury given the task of deciding if a kid is guilty of 1st degree murder. Henry Fonda plays Juror number 8…. we never find out his name, or most of their names. Fonda is the only man to vote not guilty in the first round of voting. Names do not matter in this scenario, all that matters is what each man represents and how that representation forms his opinion of the case. The film is beautifully shot by Boris Kaufman who also captured the natural anger of Lee J. Cobb in ON THE WATERFRONT (1954) his camera movements (and choice of lenses) during the exchanges at the table are such that, as the picture progresses we are drawn closer and closer to this claustrophobic situation. This movie is probably on a million “movies to see before you die” lists…. For once I agree with them. The scene below is a great exchange between Fonda and Cobb. I’ll not say to much about it as the action speaks well enough for itself.